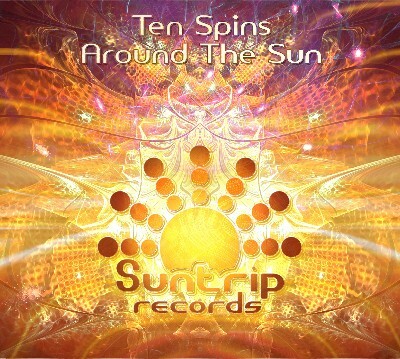 Suntrip is turning 10, and we have a special triple compilation to celebrate that: “Ten Spins Around The Sun”! The first cd features only new Goa-trance, the second has classic and Suntrip tracks remixed, and the third is splendid Ambient! In the summer of 2004 the Suntrip fairytale started. Thanks to you, our faithful fans, we are still there! And we believe the best way to say THANK YOU to the Goa-trance scene, is this unique triple cd! The first cd of “Ten Spins Around the Sun” will be a typical Suntrip goa-trance compilation, filled with new and more famous artists. Going from darker Goa-trance sounds (E-Mantra, Sirius, Celestial Intelligence) to more bright sunrise music (such as Skarma and Cymatics). To end the cd we have a unique bonus masterpiece… a blissful uptempo track by Asura vs Aes Dana, written a decade ago! The second cd is something unique: only remixes of classic and Suntrip tracks by our Suntrip artists! You ever wondered how tracks like E-Rection - Out Here We Are Stoned, Power Source - Skywalker or Khetzal - Djaningar would sound today? Filteria, Imba, Crossing Mind, Stevo with M-Run and the others will show you! The last cd is a very chilled one to give a nice, sunset feeling to whoever is listening! As usual we have some newcomers (Neurotonal and Jagoa) and some big names such as Solar Fields, Hybrid Leisureland and Mindsphere! :) If you like your Ambient deep, soft and warm, you can’t miss this!